Setting up and operating the exclusive KNX building visualisation system is child's play. New: Use clocks with astro-function, scenes and logical links to create Smart Home functions via drag ’n’ drop directly in the user interface and be inspired by the unique look and feel. 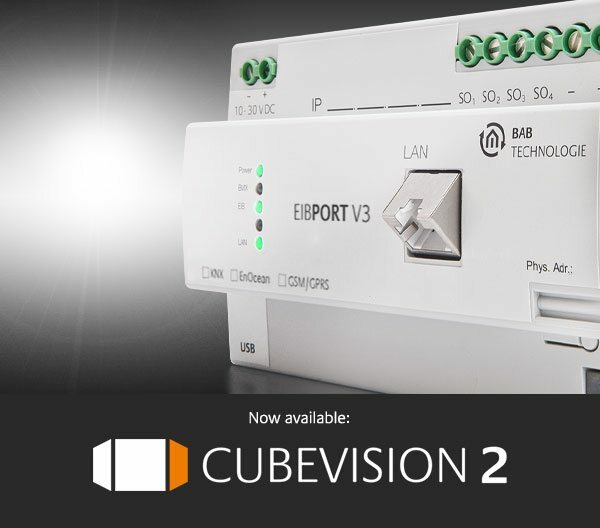 The visualisation CUBEVISION 2, which is honoured with the German Innovation Award, is now available to all EIBPORT users for free. With the brand new »Smart Function Creator« you create scenes directly in CUBEVISION: Start the built-in creator, navigate through the visualisation as usual and simply move the desired elements for the scene into the "drop zone". All selected visualisation elements are now part of the scene with their current values, such as dimming value, colour, temperature or mode. Your finished scene can then be started with time control (with optional astro function), manually using the visualisation, or by events in your Smart Home, such as reaching a certain temperature, the signal of a window contact, or the triggering of a motion detector. 1. Simply move the desired elements for the function into the »Drop Zone«. 2. Change values, order, activity, and delays between items as desired. 3. Whether manually, by astronomical clock, by logical links or an event in the Smart Home: Decide how a function is to be triggered. Discover deep learning for efficient energy management with the ENERGY MODULE. Discover deep learning for efficient energy management with the ENERGY MODULE: With the help of self-learning algorithms, the ENERGY MODULE optimises energy efficiency fully automatically. This is made possible by accurate forecasting of power generation, power consumption, electromobility and based on up-to-date weather information and forecasts. The algorithms used make the predictions more accurate over time. In addition to electricity meters, inverters and charging stations with corresponding interfaces (KNX, Modbus, etc. ), the APP MODULE can even be used to integrate IoT components and services and thus take them into account in forecasts and energy planning. The ENERGY MODULE thus becomes an absolutely unique and versatile solution for self-sufficient supply with renewable energies. The voice control Alexa from Amazon® is now integrated in the LOGIKEDITOR. The voice control Alexa from Amazon® is now integrated in the LOGIKEDITOR. Now any devices, groups and scenes can be controlled by voice command. Of course you also link the extensive functional portfolio of LOGIKEDITOR with Alexa. This makes voice control even more intelligent. Using our new web platform "logikeditor.de" you can download additional pre-built logic groups that execute application-oriented services. Use our new virtual EIBPORT. Simply make a reservation, access the free "BAB STARTER" application, register and get started immediately. Familiarize yourself with the LOGICEDITOR, CUBEVISION, CONTROL L, and the visualization editor, present visualization examples, or optionally use the virtual EIBPORT for convenient, location and system independent project planning. LOGIKEDITOR NETWORK. The download platform for logic groups. Ready-made logic groups are now available for download at www.logikeditor.de. In this way, many tasks can be completed at the push of a button. Whether control, monitoring, evaluation or communication: download our professional logic groups now and install them on your EIBPORT. 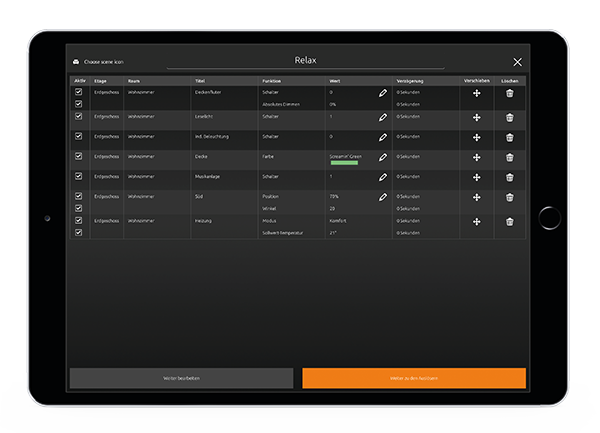 At «logikeditor.de» you can now download ready-made logic groups free of charge. CUBEVISION 2: The exclusive KNX building visualisation system is very easy to set up and operate. Use timers with an astro function, scenes and logics to create Smarthome functions via drag ’n’ drop directly in the user interface and be inspired by the unique look and feel. The German Innovation Award winning visualization CUBEVISION 2 is available to all users for free download. The sophisticated user interface scales automatically on almost all display devices. Smartphone, tablet and Co. become the control center for your intelligent home in no time. CUBEVISION 2 is currently exclusively available for the CUBEVISION MODULE. Of course we will soon offer all EIBPORT users the possibility to use CUBEVISION 2 as well. With the help of the «Quick Setup» the configuration can be done in only three steps: 1. create building structure, 2. select background images and 3. add control elements. The visualization automatically generates itself from these data. It couldn’t be easier and faster. MAKES YOU INDEPENDENT. WITH ADDICTION FACTOR. Thanks to its universal technologies, CUBEVISION is platform-independent and available on almost all devices. Whether as an app for iOS® and Android®, or in a web browser: this visualization impresses with a sophisticated, consistent design and is always generated from the same configuration data. Your building is represented in the form of a cube. By sliding to the right or left you navigate through rooms, by sliding up or down through the floors. Regardless of the visualization level you are in, CUBEVISION always provides you with the perfect depiction of the desired functions. CREATE SCENES AND SMARTHOME FUNCTIONS DIRECTLY IN THE VISUALISATION. The brand new Smart Function Creator makes it easy and intuitive to create smart home functions. Add any elements of the visualization to a scene by dragging and dropping and use clocks and events as triggers. Connect several of these triggers with AND or OR links. Creating smart home functions is easy with CUBEVISION 2. Whether a new installation or retrofitting: Equipped with either a KNX/TP or an EnOcean interface, the CUBEVISIONMODULE fits into almost every installation. KNX IP ROUTER FUNCTIONALITY INCLUDED. Use the integrated KNX-IP router functionality of the CUBEVISIONMODULE. A separate device in the installation is no longer necessary. It can also be used as an interface to the ETS or as a gateway between EnOcean and KNXnet/IP. EIBPORT (Automation and Visualisation Gateway for KNX and EnOcean). CUBEVISION MODULE (Smart Home Gateway for KNX and EnOcean). APP MODULE (IoT+ Gateway for KNX and EnOcean). AUDIO MODULE (Multiroom Audio for KNX). DUO DMX GATEWAY (Bi-directional DMX KNX Gateway). CUBEVISION Visualisation – KNX Smart Home Visualisation in no time. LOGIK EDITOR Web-based Graphical Logic Editor. JOB EDITOR Form Based Job Editor. Integration of various Web-Services (Open Weather Map, IFTTT, Pushbullet). Book your place at the Product Training Day at BEMCO here. The CUBEVISIONMODULE offers a unique building visualisation and is very easy to set up and operate. 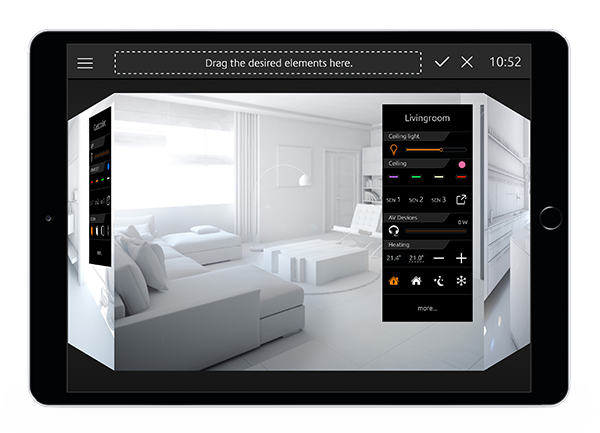 With CUBEVISION 2 you can now create your own scenes and Smarthome functions by drag'n' drop within the user interface. Update available from the 2nd quarter 2018. The 10-inch hybrid push-button «HTS10» intelligently combines the possibilities of proven, «natural» key operation with the advantages of a precise touch screen. With its configurable mechanical buttons, any desired function can be called up without having to navigate through a user interface. The integrated sensors of the «HTS10» offer great potential in the intelligent home für Comfort, security and energy saving. The brilliant full HD display and the integrated WLAN interface make the «HTS10» the perfect visualisation client for building automation. Available from the 3rd quarter 2018. No compromises. No detours. The brand new SMARTSURFACE with its brilliant Full-HD-Display combines state-of-the-art technology and architectural design possibilities. Whether drywall construction, brickwork or furniture – flush mounted, the touch panel joins seamlessly with almost all surfaces. The «Smart Dots» integrated into the high-quality, continuous glass surface allow direct access to useful functions – without any detours. Due to the stationary installation and the integrated presence detector, the SMARTSURFACE is immediately available as a control and information centre as soon as you approach it. The uncompromising selection of components guarantees trouble-free and noiseless 24/7 operation. The voice control Alexa from Amazon® is now integrated in the LOGIKEDITOR (firmware 3.6.0). Use voice commands to control any devices, groups and scene. Of course you also link the extensive functional portfolio of LOGIKEDITOR with Alexa. This makes voice control even more intelligent. Using our new web platform, you can download free of charge further ready-made logic groups that execute application-oriented services. Another update will add a camera archive, long-term data recording for up to three years and door communication in conjunction with ABB® Welcome products and the new INTERCOMMODULE. Impossible? There’s no such thing. With the APPMODULE you can easily connect the whole world of IoT with KNX and EnOcean. Whether Amazon® Alexa, SONOS®, Philips®hue, Netatmo®, IFTTT, Apple® HomeKit™, Google® Assistant, or DoorBird®: Install these and many more Smart Home Apps and get started. Very simple. Hassle-free. Once integrated, you control IoT devices with any KNX or EnOcean components. And vice versa, of course. For example, start your favourite songs on Denon® HEOS with a wall button or control your KNX lighting with Apple® HomeKit™. The constantly growing portfolio in the BAB APP MARKET offers Smart Home Apps for the integration of IoT devices and services as well as functional enhancements such as intelligent presence simulation. With the brand new «Smart Screens» you can even control any IoT, KNX and EnOcean devices in one interface directly with your smartphone. The integrated KNX router functionality and the convenient KNX project import complete the APPMODULE’s scope of features. Update and «Smart Screens» available as of Q3 2018. The device, which is four modules in size, has two DMX512 interfaces that can be controlled separately from each other. With one gateway two DMX worlds can be controlled independently of each other at the same time. The bidirectional design allows you to control KNX devices with DMX devices and vice versa. Master or slave operation can be set for each interface. The REMOTE GSM LED CONTROLLER enables the time-synchronous, location-independent control of several RGBW luminaires via GSM™ The time signal in GSM™ guarantees an absolutely synchronous color or brightness change of several controllers - worldwide. After the controllers have been connected to the luminaires, the rest of the configuration is done via an Internet portal. The INTERCOMMODULE establishes the connection between an IP-capable video intercom system and a client. It converts audio and video signals into the WebRTC standard and additionally transmits via SIP between intercom and client. This makes it easy to integrate door communication into the visualisations of the EIBPORT and the CUBEVISIONMODULE. Available from Q3 2018 (integration for ABB® Welcome). The perfect addition for distribution hubs: the SDMODULE is connected to the USB interface behind the protective cover. The SD card slot on the front panel gives the user access to the storage media without having to remove the distributor cover. Take advantage of many improvements, brand-new features such as loop detection in the LOGIKEDITOR, or convenient plug and play integration for selected Axis cameras models in CUBEVISION. From firmware version 3.5.0 on, use the new web update for the EIBPORT. This new update mechanism enables updates in much shorter time. Users of earlier versions (before 3.5.0) can use the classic update. This graphical editor, based solely on latest web technology, offers completely new possibilities to users and system integrators. You can use the comprehensive commenting and search functions to organise your projects and you can reuse logic groups by exporting and importing them. You can simulate complex scenarios before activating them in the EIBPORT. New logic elements such as »Calendar«, »Lua Script«, or »Statistics« enable you to comfortably realise challenging tasks. With little helpers, the so called »Tools«, you can change or filter values between two logic elements. Its web-based, platform-independent technology allows you to use the LOGIKEDITOR on almost any device. It can be used in parallel to the existing »Job Editor«. Your configured jobs from the classic editor will stay intact and you can continue to edit them there. All changes of the new firmware can be found in ChangeLog (PDF). Take advantage of many improvements and stabilizations for LOGIKEDITOR, CUBEVISION, and more. 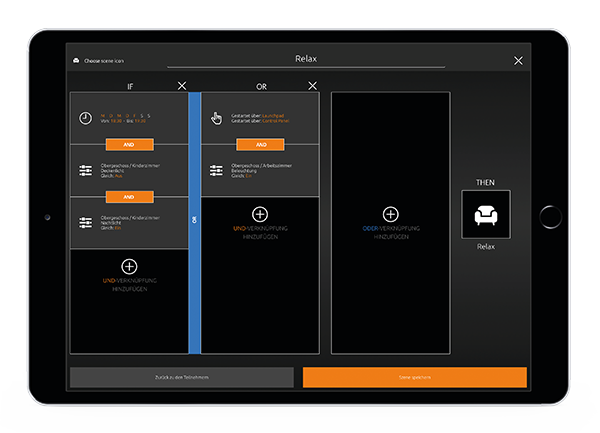 BAB APP MARKET News: HUE:CONTROL Pro for APP MODULE. This App connects your Philips® hue Bridge with KNX® so that you have access to all connected Philips hue lights through the building automation. The simple authorisation process makes connection particularly easy. The 50 freely definable "Alerts" which the hue lights use to inform themselves about the desired conditions (e.g. light red if the doorbell rings) are a particular feature.The Pro Version enables you to control up to 100 Philips® hue devices. This app is a third party product. It is not affiliated in any way with Philips®. For us, as a manufacturer of innovative and long-lasting KNX products, security is a vital issue also for our older hardware. Through information provided by external experts we were able to increase the data security when accessing EIBPORT 2.1 (08/2008 - 08/2011) devices via Internet. Should you have further questions regarding this topic, or others, send us an email (info@bab-tec.de) or call us at +4923147642530.